Women who experience severe heatwaves or cold snaps during their pregnancy are more likely to have small and underweight babies, according to a study published in the academic journal World Development. 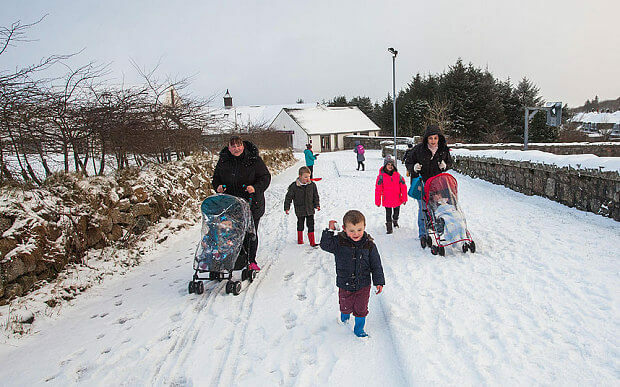 It is the first time that extreme changes in the weather have been linked to birth outcomes. Babies who are born smaller are more likely to suffer from health problems in later life, such as diabetes, obesity, heart disease and high blood pressure. Researchers from The World Bank in the USA and the Institute for the Study of Labour in Germany looked at more than 1.5 million births in Columbia between 1999 and 2008. They found that exposure to high temperatures led to weight reduction in newborns and a slightly increased chance of premature labour. Cold waves were also found to affect childhood height. Extreme weather events also lowered Agpar scores, which are used to monitor the health of newborns and test for skin colour, heart rate, reflexes, muscle tone and breathing of newborn babies five minutes after birth. “Temperature shocks, which have been largely ignored in previously literature, adversely affect health outcomes at birth ,” said Dr Mabel Andalon, who led the research. “Our findings suggest that exposure to moderate cold temperature shocks in the womb and early life affects children’s height. We also found that birth weight declines with exposure to moderate heatwaves during the third trimester of pregnancy. The team used climate data from the University of East Anglia to compare the birth records to temperature during various trimesters. Heatwaves and cold snaps are defined by the daily maximum or minimum temperature carrying by five degrees Celsius from the normal temperature for five says in a row. Researchers believed that extreme weather puts stress on an expectant mother. Core temperature is higher for pregnant women in any case and heatwaves can send it to dangerous levels. Hot weather can also increase the prevalence of disease carrying insects, while cold snaps increase the risk of cold-loving viruses, like flu. Weather shocks can also impact food availability, potentially leading to malnutrition. The weather and time of year appears to be crucial to the development of babies in the womb. Last year researchers at the University of Indiana warned women who were hoping to fall pregnant to avoid ‘toxic June’ because youngsters do less well if they are conceived in the summer money. The highest chance of having a healthy baby was in December with three extra babies surviving per every 200 pregnancies compared with in the summer months. Scientists believe that high levels of pesticides sprayed on crops and differing levels of light and vitamin d could be responsible for the differences. It is also thought that success rates may follow ancient evolutionary patterns which encourage babies to be born when times are good, such as during the harvest. There was a notable slump in healthy babies born around Valentine’s Day which is the due date for the June babies. The overall birth rate also slumped in February when winter disease peaks among adults. Previous studies have found that people born in November are far less likely to develop Multiple Sclerosis than those born in May, which has again been linked to vitamin D.
Commenting on the research, Dr Alison Wright of the Royal College of Obstetricians and Gynaecologists said: “This study in World Development examines the potentially damaging effect of climate change on pregnant women and their babies. In this study, exposure to heat waves during the last three months of pregnancy was associated with a slightly lower birthweight for women in rural Columbia. As temperatures increase across the world, this could become a worrying trend and more research should be conducted in this area.